Theme parks are fun, but they can be expensive. Thankfully there are ways to lighten the burden a little, like All Day Dining at SeaWorld. Here’s what you need to know before you head to the park. My kids are no strangers to theme parks. We’ve been visiting theme parks since the kids have been old enough to walk. From the thrills, to the characters, to the yummy food, we love all things theme parks! Well, except for the crowds and long lines. On a recent trip to SeaWorld we purchased the All Day Dining Deal for our day at the park. Since we were at the park from opening to around dinner time, I decided to purchase the dining plan to see if it was worth it. The All Day Dining Deal lets you enjoy hassle-free dining at SeaWorld and Aquatica San Antonio. You pay one price and eat (and drink) all day long, without bringing out your wallet again. 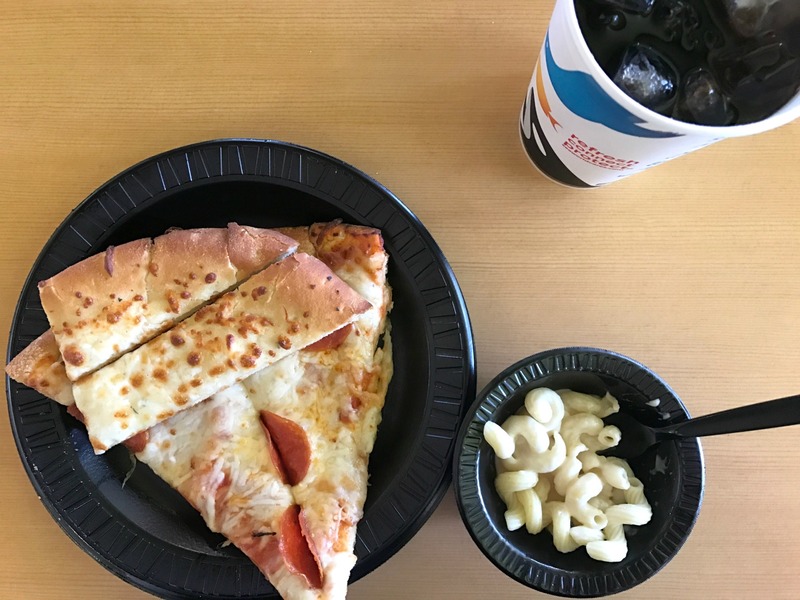 Sea World All Day Dining includes an entrée, a side item or dessert, and a non-alcoholic beverage as often as once every hour. Like most other theme parks we’ve visited, any child over the age of 9 is considered an adult. This is done on an honor system since they don’t ask for any age documentation. The bands are different colors for adults and children, so anyone with a child band will only be allowed to get a child’s meal in the restaurants. With that said, if your 9 year old eats an adult meal most of the time, you might consider buying them an adult band. Or if your 14 year old has a smaller appetite, a child band might be better for them. Over the years All Day Dining has changed and one of the more noticeable differences is that you can only use your band once per hour. Before this change you could use your band as often as you wanted. I’m assuming that people abused the system and that’s why this change had to be implemented. I don’t mind that the new system keeps people more honest, but there is a flaw in the system in that even if you just get a drink, instead of getting a full meal or just a snack, you can’t use your band again for an hour. I would like to see SeaWorld implement a way that you could use the band more than once per hour if you haven’t redeemed a full meal (entree, side, and drink) that hour. My family goes through bottles of water like crazy and having a beverage only cart would be beneficial to those who don’t want a full meal. I would love to tell you that All Day Dining can be used anywhere in the park but, that’s just not the case. You can only use the dining plan in participating restaurants. You can not use your wristband at cart locations, stadium vending, or any other specialty dining experience. 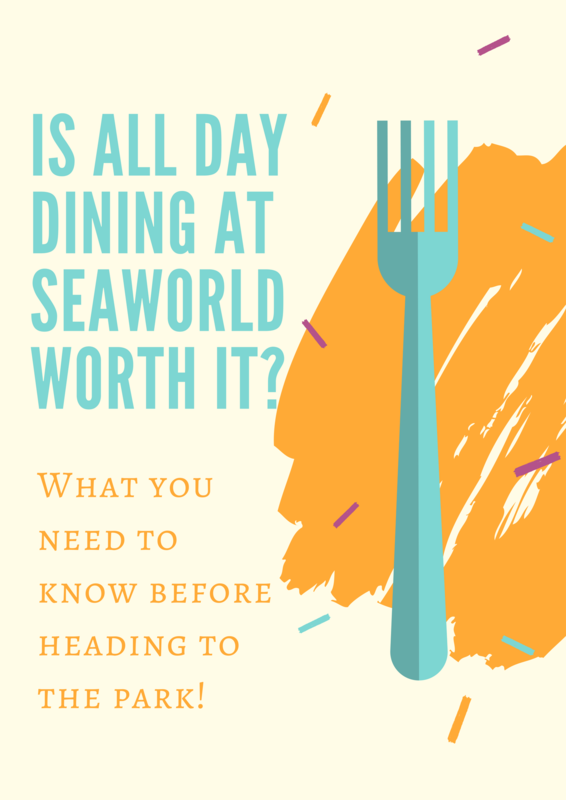 Is All Day Dining at SeaWorld Worth It? Well, that depends. If you plan on being at SeaWorld all day long and eating at least two full meals, then yes, I think it’s worth it. Most meals at the restaurants average in the $9 – $11 range, with some, like the all-you-can-eat pizza buffet, being higher. Add in a side item (some options are pickle slices or cups of fruit) or dessert (some options are chocolate pudding or cookies) and that’s $3 – $5 more, depending on what you get. You could easily spend about $18 per adult meal. Add in bottles of water and additional sides or desserts throughout the day and it’s definitely worth it. If you don’t plan on eating at least two meals or taking advantage of a bottle of water every hour to stay hydrated in this Texas heat, then it may not be worth it to you. It’s also important to note that not all menu items are available with All Day Dining at some restaurant locations. You can easily see which items are available with All Day Dining by the color coded dots beside available menu items. For my family, All Day Dining saved us money and we were happy with our purchase. Looking for an encounter with sea life while at SeaWorld? 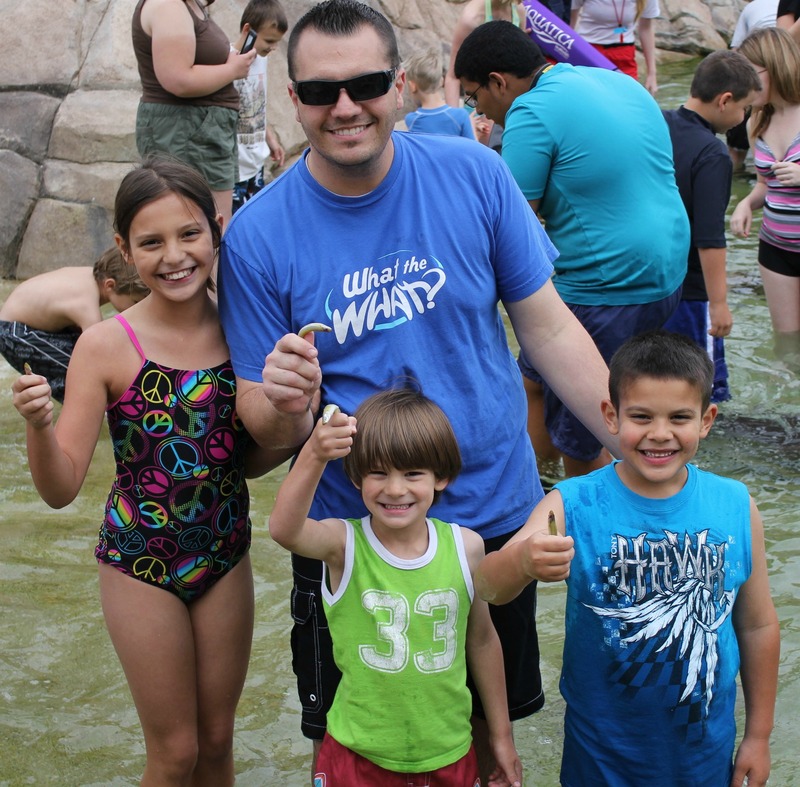 Check out more about the Stingray Encounter at SeaWorld. We did this when we were there and it was a good option for us. I would definitely do it again. This sounds like a really great option. I will have to keep this in mind the next time we go to Seaworld. I can see how this would be a good option on longer park visits. We do tend to get hungrier when doing a lot of walking in the heat. That’s actually a really good price for being able to eat all day at a park. Thank you so much for sharing this info. I have used it in the past. It really is a great thing to have especially for drinks. This is a good option for people who will be spending all day at the park. It’s cheaper than buying multiple drinks and meals. I think having the meals would be great but I might want to eat too much. If you are there all day it probably is nice to have drinks on a regular basis. This sounds like a really interesting system, it is a shame it locks you out for an hour even if you just get a drink as making sure you are hydrated is a must. Oh wow I had no idea about this, that’s a great perk! We are headed there in September and cannot wait! Of course it’s worth it, at least for me! I think it’s better than spending money on food every time you get hungry. It’s perfect especially if you’re going to be there all day. This sounds amazing!! Will try this next time we visit Sea World! I think the All Day Dining pass at Sea World will work for my family. My boys have huge appetites and I know I will get more that what I paid for with those boys. I agree with you on the idea of a beverage cart, or even just a bottled water station. That should not be included in the restriction. I wish they had this at Busch Gardens in VA! I could have easily done this option between Water Country USA and there. My family and I have used this before. It is a great way to save time and money for sure. I have never been there but this seems like a worthwhile promotion! a question for anyone who can answer, we are taking a granddaughters June 18th 2018 and was wondering if SeaWorld San Antonio has the option to buy the refill drink cups like Six Flags over Texas in Dallas offers you get a drink band and only pay one price for all day? At one time they did have the refillable souvenir cups that you could purchase and then refills were only $.99. These were good for the entire year. I haven’t bought one recently because we do the All Day Dining now and that includes drinks. Sorry I couldn’t be of more help. Hi, can you tell me if this dining option is DINE IN ONLY? Thank so much! We plan on heading to the SW in San Diego full day. Also, if you purchase the all day eating, does it include Aquatica park too? Or is it separate? I’m not sure I know what you mean when you say “DINE IN ONLY”. I’ve never been to SW San Diego, just SW San Antonio, so my experience is only based on that park. They might be the same but I don’t want to promise that just in case things are different. For SW San Antonio, you can purchase All Day Dining for just SW or you can purchase the option for SW & Aquatica. There is a $3 – $5 price difference (at the time of this post) when adding the Aquatica option. I hope this helps. Please let me know if I can be of further assistance to you while you’re planning your day at SeaWorld. If one person in the family purchases the all day dine, does everybody else have to? What if any sharing is allowed? I’m not sure of the answer to your questions – I’m so sorry. I looked on the SeaWorld website but it wasn’t stated there either. I’m going to assume that sharing is not allowed but I didn’t see it stated on the website. I also don’t know if everyone in the party has to buy if one does. We’ve always just purchased for everyone in our party so I don’t have experience with that either.